Perhaps the only thing more frightening than a tornado is one that strikes while you're asleep. Tornadoes occurring at night are more than twice as likely to be deadly as those during the day, according to a recent study. Examining roughly 48,000 tornadoes in the U.S. from 1950 to 2005, a 2008 study led by Walker Ashley from Northern Illinois University found roughly one in every 20 overnight tornadoes were killers, compared to roughly one in every 50 daytime deadly tornadoes. A house is damaged by a tornado that ripped through the town of Rosalie, Ala., around midnight on Wednesday, Nov. 30, 2016. Making up only about 27 percent of all tornadoes, these nocturnal events comprised 39 percent of tornado deaths and 42 percent of killer tornadoes in that 55-year period. A recent example was at least one deadly overnight tornado in northeastern Alabama early Wednesday morning. The Ashley study also found that a plateauing in tornado deaths in the past few decades could be explained primarily by an overall increase in nighttime fatalities. Some reasons for this are more obvious. Unless lit by at least somewhat frequent lightning, you may not see a tornado at night. One challenge the meteorological and social science communities face is getting the public to take shelter immediately, without first "confirming the threat" of a tornado by looking outside, wasting precious seconds to reach shelter. Fewer storm spotters may be willing to take the risk storm chasing at night, reducing the ability of meteorologists to confirm tornadoes in progress at night. Of course, you may not be awake at the time. "Another problem is that people are often asleep and caught unaware," said The Weather Channel severe weather expert Dr. Greg Forbes. If you're a sound sleeper and don't have a way to receive warnings overnight, the consequences could be deadly. Where we are at night is another factor. "People are usually at home, often in structures that are not as sturdy as their place of work. Mobile homes are particularly vulnerable," said Forbes. Percent of each state's tornadoes from 1950 through 2005 that occurred at night. A disconcerting finding in the study is that for many of the most tornadic states in the U.S., a sizable number of tornadoes occur at night. One-third to just under one-half of all tornadoes in 11 states from Oklahoma to West Virginia in 1950 to 2005 touched down at night, according to the study. The peak state was 46 percent in Tennessee. In another 2007 study, Ashley found the South has some of the highest numbers of mobile homes in the nation. Furthermore, 61 percent of tornado fatalities in mobile homes occur at night. All three fatalities in the November 29-30, 2016 overnight tornado in Rosalie, Alabama, were in a mobile home. Add population growth in the South, primarily in large cities and their suburbs, and you can understand the overall increasing vulnerability of this region to these events. The calendar also plays a role in high nocturnal tornado death counts. Unlike other parts of the country enduring harsh winter cold that eliminates the instability needed, tornadoes can be a concern any time of year in parts of the South. Thus, given the fewer hours of daylight, contributed to by standard, rather than daylight time, any cold-season southern tornadoes have a greater chance of occurring after sunset. 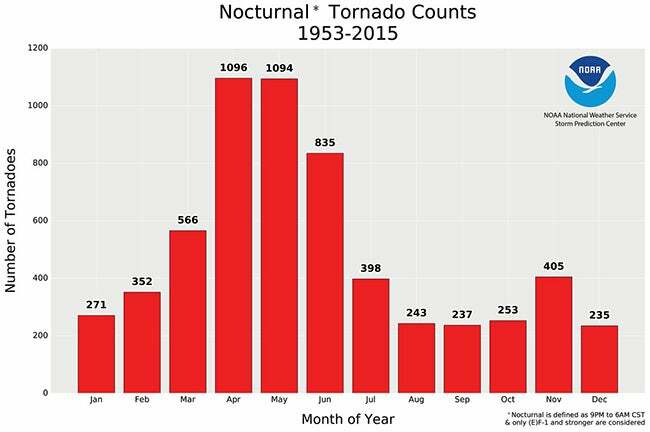 U.S. nocturnal (defined as from 9 p.m. to 6 a.m. CST) tornadoes (F/EF1 or stronger) by month from 1953-2015. Even the core winter months of December through February have averaged 3 to 6 nocturnal tornadoes in the U.S. each month from 1953 through 2015, according to NOAA's Storm Prediction Center. There's also a pronounced nighttime tornado maximum in November, coinciding with the often-discussed "second season" for severe weather targeting the Deep South. These colder month tornadoes often occur with a very strong jet stream, meaning winds aloft can move the parent supercells or squall lines in which these tornadoes are embedded at speeds of 60 mph or more, giving little time to seek shelter. "There have been many infamous nocturnal tornadoes," said Forbes. "One struck Evansville, Indiana, on Nov. 6, 2005. Nearly all of the fatalities were in mobile homes. Deadly nocturnal tornadoes struck Florida on Feb. 23, 1998, and Feb. 2, 2007." Also, the public's overall awareness of severe weather may not be as high during the winter months, even in areas that can and do experience severe weather any month of the year. Buy a NOAA weather radio. You can find these at most electronics retailers. They feature warning alarms that can be set to sound loudly when any National Weather Service tornado or severe thunderstorm watch or warning is issued. Your smartphone can alert you. Most newer smartphones are capable of receiving wireless emergency alerts from your local NWS office. These include tornado warnings. Make sure your smartphone is charged sufficiently and left on overnight, and a special tone and vibration will occur twice when a tornado warning is issued. Note, however, this will not sound for a tornado watch or severe thunderstorm warning. Other weather apps can also alert you. Many weather apps, including The Weather Channel and Weather Underground apps, can also send alerts to your smartphone, tablet, or smartwatch. Know where to go. "Be sure you know your safe location ahead of time so you can get there quickly, even if you have to get there in the middle of the night," says Forbes. "Keep flashlights handy." In general, your awareness of the threat for overnight severe weather, before you go to sleep, is very important. Is a severe thunderstorm or tornado watch extending into the overnight hours? Or is there a threat of severe weather developing overnight? Make sure your weather radio or smartphone is ready to alert you. It may save your life.